As if all that wasn't enough to love this group, Cherisse further informed me they would be enjoying some of the chapter titles from QUEEN OF THE ROAD (again, for those of you in the dark - and aren't you tired of being so? - these refer to martini receipes), in chilled glasses "while soaking up the few hours that our husbands have our children." (They're all moms of young kids.) Clearly, after meeting for four years, this group has it down. 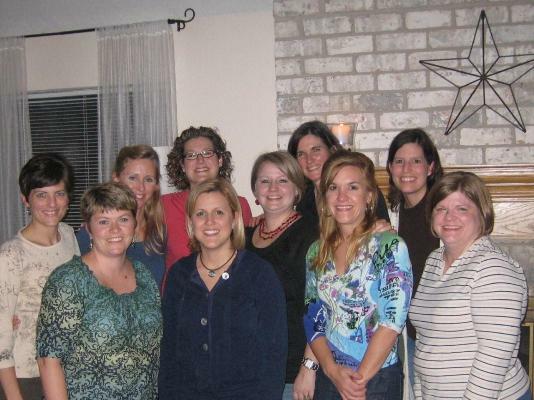 From far left: Lisa, Cherisse (the short one - her description), above her is most of Mistye, next to her is Kristi, below her is Briggitte, above her is Cynthia, behind her is Angela, in front of her is Deanna (a fellow, er... lady RV'er and her first night in the book club - hope I wasn't responsible if it turned out to be her last), next to her is Lisa (also new and just moved back to the States after 2 years in Italy) and finally, Jill. Absent: Kelly wasn't able to come as she was home with a brand new baby (congrats Kelly!) and Brenna just moved to an obscure island in Russia, where she is currently braving some unimaginable snowstorms. Gee, Brenna. You didn't have to go to such lengths to avoid reading my book. A simple, "Not my cup of borscht," would have sufficed. Note the lone star over the fireplace. Cherisse purposely included it in the shot, because in the book, I make fun of Texans putting their Lone Stars all over the place. Glad Texans have a sense of humor. Even more so, as if I could have come in person, Cherisse assured me she had a "huge yard with a big gate." I certainly hope she was referring to our bus. And, in that case, Cherisse: Be careful what you wish for! Great name for a group! I'm stealing it immediately. I live in the boonies. No one will ever know. . . I still vote for stealing. Oh, wait. I'm the Queen. No voting. Just stealing. I was so sad to miss out on your call but the 16 hour time difference from Russia is just a nuisance. You'll be happy to know your book was the one and only book that i packed in my luggage and I read it soon after our arrival here. Thoroughly enjoyed it but definitely missed sharing the martinis with my friends. Thanks so much for letting me know, Brenna. I'm so glad you enjoyed the book, but I'm especially pleased it was not the reason for your self-imposed exile. This page contains a single entry from the blog posted on March 11, 2009 5:43 PM. The previous post in this blog was My Dream Job. The next post in this blog is Island Life.